What do people believe they say. There is a gap between what the Ten Commandments actually state, and what the public perceives that they say. Most people incorrectly believe that all of the Commandments govern moral behavior in society: to not lie, steal, commit adultery, etc. In reality, the first four commandments relate to religious beliefs, not to behavior. They are uniquely related to Judaism, Christianity and Islam. They are offensive to the followers of many other religions. Only the last six relate to moral behavior in society. "The Fraternal Order of Eagles has promoted the Ten Commandments not in an attempt to impose religion on the masses, but rather in recognition of their role in the very foundation of our legal system. ... Our very laws are built on the bedrock moral precepts of the Ten Commandments." This is only partly true. The first half of the Ten Commandments are a series of commands about the recognition of God. It is only the second half that deal with actual behavior towards other humans. 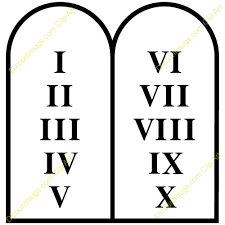 The latter are not unique to the Ten Commandants; they are common to almost all religious systems and are seen in many religious and secular law codes -- some of which preceded the Ten Commandments. I reality, law codes in the U.S. and the rest of the western world are derived from a variety of sources, including the Ten Commandments, Roman laws which were based on their ancient Pagan religion, English common law, laws of Native Americans, etc. Some North Americans feel that everyone should follow all of the Ten Commandments, whether they be Agnostic, Atheist, Buddhist, Christian, Hindu, Jewish, Muslim, Wiccan, etc. They push for the Decalogue to be posted in schools, court houses, publicly owned parks, etc. so that people will get the impression that the federal, state, and municipal governments and school boards all promote Judeo-Christianity. Many overlook the effect of the first Commandments which, in effect, denigrate and condemn the beliefs of students who follow non-Abrahamic religions, or no religion at all. Others feel that posting the Decalogue can generate religious conflict, and make some of the public feel like second-class citizens. Some feminists, civil libertarians and others find portions of the Ten Commandments repulsive. They favor restricting the display of the Decalogue to religious and other private property and not displayed in or at government buildings, etc. They cannot promote one religion over another. They cannot promote a religious lifestyle over a secular one. They cannot promote a secular lifestyle over a religious one. Posting the Ten Commandments clearly promotes the main Abrahamic religions -- Judaism, Christianity and Islam. By requiring religious services on Saturday and threatening people if they do not worship Yahweh, the Commandments denigrate followers of the remaining world religions and the religiously non-affiliated which comprise by slightly under half of the human population. Thus, to be constitutional, the Ten Commandments cannot be posted on public land in isolation. They can only be displayed along with other sets of religious laws, in order to meet the first criteria. They must be accompanied with secular laws to meet the second criteria. That is, they would have to be part of a cultural display. During the 1950s and 1960s, the Fraternal Order of Eagles erected as many as 4,000 markers, statues, and monuments featuring the Ten Commandments in public parks, government buildings, etc. Some were involved in the promotion of the 1956 film, The Ten Commandments, and were dedicated with Charlton Heston and Yul Brynner present. They were the actors who played Moses and the unnamed Egyptian Pharaoh in the movie. There were occasional lawsuits filed prior to 2002 to force the removal of these monuments from public land. In 2001. the U.S. Supreme Court let stand a lower court order that a Ten Commandments monument in Elkhart, IN, be removed. It later refused to hear similar cases. Conflict escalated in 2002-NOV, when U.S. District Judge Myron Thompson ruled that the presence of Chief Justice Moore's Ten Commandments monument in the Alabama state courts building "constitutes government endorsement of religion." Chief Justice Moore refused to remove the monument. He was later relieved of his judicial responsibilities. The monument was subsequently removed by others. However, his refusal to follow the court order gained him so much public support that he was re-elected as chief justice years later. Since 2001, dozens of lawsuits have been launched across the U.S. in an attempt to remove Ten Commandments monuments and displays. Many have been launched by branches of the American Civil Liberties Union in different states, and by Americans United for Separation of Church and State. "Monument opponents say that America's increased [religious] diversity accounts for many of the lawsuits. 'The religious motivation (of the monuments) was [originally] not as obvious when there weren't as many religious minorities or people with no religion,' says the Rev. Barry Lynn, director of Americans United for Separation of Church and State.' The lawsuits are occurring 'because [opponents] now feel they have a shot at winning. But the cases are a declaration that [the monuments are] important, too'.'" Sue A Hoffman is the author of the book: "In Search of God and the Ten Commandments: One Person's Journey to Preserve a Small Part of America's God-given Values and Freedoms." 2 It was published during 2014-JUN. She spent thirteen years traveling around the United States searching out and photographing the 184 known existing Ten Commandment monoliths. She is in favor of preserving all 184 and is strongly opposed to the removal or relocation of any of the monuments from public land. In mid-2014, there were three active lawsuits based on the principle of separation of church and state contained in the First Amendment to the U.S. Constitution. It was written to create a "wall of separation" between governments and religious faiths. Sue A Hoffman, "In Search of God and the Ten Commandments: One Person's Journey to Preserve a Small Part of America's God-given Values and Freedoms" (2014). Read reviews or order this book safely from Amazon.com online book store Amazon.com customers rated the book with 4.8 stars out of 5. Amazon sells it in paperback format for US$ 41.46. Less expensive used copies can often be obtained .